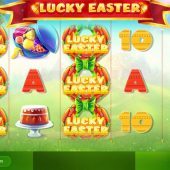 Lucky Easter slot is festive treat from Red Tiger Gaming, and typically has the high-definition graphics we associate with this developer and a host of in-play features which they also like to put in their games. With gentle fluffy music and dear little bunnies appearing on the reels this seasonal slot may or may not put some spring in your step. But is it a golden egg or a rotter? Aside from the usual card icons there are five picture symbols you may expect from Easter - an Easter bouquet which is the top-paying icon at 10x bet for a 5-of-a-kind win and appears, like the other symbols, stacked fully on all reels, including the Wilds. We then see the child's egg full of sweets for 8x and a carrot, carrot cake and lastly a cupcake in the form of a rather depressed bunny at 5x bet. The card icons pay from 2.5x down to 0.5x bet for the lowest, the 10. The Wild takes the form of a chick emerging from a colourful egg and appears on all 5 reels with no multiplier attached, but does pay 20x bet if you are lucky enough to see 5 on a pay line. -Reels become full of only the picture symbols and card icons are removed. -Mega Wild Chicks means the Easter bunny has given you a colossal 3x3 Wild. -Wild chicks hatch from eggs the Easter Bunny puts over the reels. -Basket Wild gives any reel win on that spin a multiplier up to 20x. The joys of Easter aren't finished yet, as we have two triggered features in both cases requiring scatters on reels 1, 3 and 5. The first is a trail whereby you pick from bunnies emerging from 6 burrows in the grass. They will grant to up to 6 moves along the trail similar to the Leprechaun Bonus Trail in Rainbow Riches slot. There are strange events here though, as dark parts of the trail can offer higher returns than the lower amounts that follow after. If you get to the end of the trail, you see a giant stripy Easter Egg and these stripes award 100-800x bet if you progress up them! The free spins are simply choosing an egg for the amount awarded, 5-15 usually. During these free spins you will find a high occurrence of the 4 in-play features described above. If you get the Giant Wild, hope it lands on reels 1-3 or 2-4 for a guaranteed win.